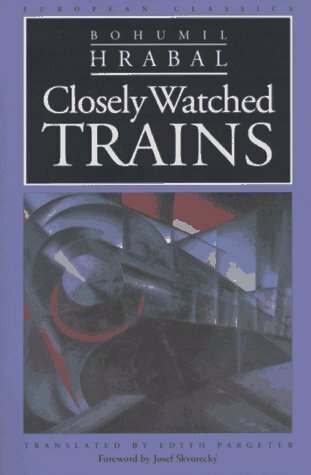 Episode 185: Bohumil Hrabal, Closely Watched Trains | Book Fight! This week on the podcast, we attempt to answer the age-old question: Do you read the foreward first, or do you wait and go back to it once you’re finished with the book? Also we dig into a classic of Czech literature, talk about translations, and for some reason we do a pretty deep dive into the McDonaldland universe. As always, you can stream the show right here on our website, by clicking on the player below. Or download the mp3 file. You can also find us in the iTunes store, where you can subscribe (for free!) and never miss another installment. Note: We just recorder our very first episode of Book Fight After Dark, in which we discussed a Harlequin romance novel about a NASCAR driver and an actuary. It’ll be coming out soon, and if you want it, you need to subscribe to our Patreon for $5 a month. Your subscription helps support the show, which will continue to deliver 4 free episodes each month, and you’ll also get access to a monthly bonus episode. Quite the bargain, if you ask us. Whether you subscribe or not, we appreciate you listening! And if you like the show, please help spread the word to your book-loving friends. Categories: Episodes | Tags: Bohumil Hrabal, Czech novels, Jimmy Buffet's early work is pretty good actually, McDonaldland characters, Nazis are the worst, what's the deal with Grimace, WWII novels | Permalink. I finally listened to this episode and left wanting to read Too Loud a Solitude more than this book.